Fantastic, spacious, 2-bedroom condo with water views across Estero Bay to Fort Myers! Great views of the mangroves and water from the generous sized, screened balcony on the quiet side of the building. Gorgeous sunsets visible over the lagoon. 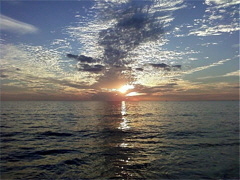 Direct access to the beautiful sandy beaches on the Gulf of Mexico! Beautiful grounds and well cared for building. Just a mile from popular Santini Plaza - with restaurant and shopping venues. - Large Master suite with vanity and large walk-in closet, door to lanai. - Renovated kitchen with new granite, solid maple cabinets and breakfast dining area. - Second bedroom with large closet, built in furniture including desk and Murphy bed. - Split configuration - bedrooms at opposite sides, all have windows to the view. - Utility with stacked washer/dryer; additional laundry and utility sink in hall. - New water heater, a/c units replaced a few years ago. - Extra locked storage in common laundry room. - renovated kitchen with raised flat ceiling, new lighting, new upper cabinets and new granite. game room, exercise equipment, saunas, showers. * Library and Card Room. This is great location on the less congested part of the Island. 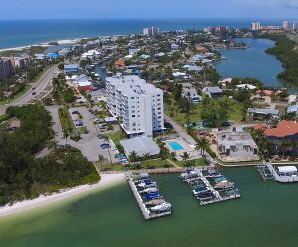 Easy, secure access - friendly community - walk under the bridge to stroll along the white sand beach, fish from the pier, launch your kayak and explore the back bay waters or just watch the dolphins play - whatever makes your heart sing - this community offers so may options! Call Peter 410-533-4219 for more info!